Find out about our stay at the Sol Costa Atlantis in Puerto de la Cruz, thanks to Jet2 Holidays. If you’re thinking of taking a holiday in Tenerife, have you considered heading to the North of the island to the city of Puerto de la Cruz? Recently, Jet2 Holidays invited Mark and I to visit Tenerife in the Canary Islands. We spent 4 nights at the Sol Costa Atlantis hotel, close to the city’s seafront promenade. This was my first package holiday in nearly 20 years, and I was keen to see what the hotel would be like. It’s no surprise that Tenerife is such a popular destination for UK holidaymakers. Direct flights to Tenerife South airport leave from cities across the UK. And in less than five hours, you can be enjoying the gorgeous year round sunshine of Tenerife. We flew with Jet2 Holidays from Birmingham Airport, and our flight was around 4 hours long. Once you land at Tenerife South, the drive to Puerto de la Cruz takes just a little over an hour. Our Jet2 Holiday included free transfers to and from the hotel from the airport by coach. But you could easily hire a car and drive yourself, which would let you explore more of the island. When you reach Puerto de la Cruz, the Sol Costa Atlantis is just a short walk from the seafront. It’s location is ideal for exploring the city, but still in a fairly quiet setting. So you shouldn’t be disturbed too much late at night! Checking in at the Sol Costa Atlantis was very straightforward. Our Jet2 Holiday was on a bed and breakfast basis, staying in a standard Sol room. Our reservation details were checked over, and I was asked to leave credit card details with reception for any extras. This meant that we could pay for drinks at the bar or dinner at the end of our stay. The hotel receptionist also asked if we’d like to upgrade to a more expensive room. You can do this when booking your holiday but it was nice to have the option on check in as well. Check out is at midday, but they are able to store your luggage securely if you are leaving Puerto de la Cruz later than that. The receptionist quickly ran through some of the other facilities in the hotel. She also showed us where we could find details of when our pick up would be on departure day. After giving us a voucher for free pool towel hire and a handy map, the receptionist handed us our room keys. We headed up to our room on the 7th floor. My first impression of the room was that it was quite spacious for a standard room. The cool, neutral colours of the decor and fabrics give it an airy feel, and there are small splashes of colour that stop it looking too bland. Large twin beds were pushed together to give a generous Superking sized bed. There was also a small seating area and a writing desk with a medium-sized TV on the wall above it. The bed was very comfortable, and I slept well during my stay at the Sol Costa Atlantis. Two lightweight quilts ensured that we were comfortable in the warm Tenerife night-time temperatures. Ideally I would have preferred to have a second pillow, but I’m sure I could have requested one from reception. The wardrobe had a reasonable amount of hanging space and several shelves, and there was a bedside table with a drawer on each side of the bed. So there was plenty of room for storing all of our clothes. The room was very clean and we were happy to see that it had air-con. However, housekeeping closed the long curtains every day to help keep our room cool and comfortable. There was a small safe in the wardrobe, with an additional charge of 3 Euro per day for using that. It’s a long time since I came across a hotel that charged for the use of a safe. It seems like such a basic facility these days, especially in a popular holiday destination. I was also surprised to see that you couldn’t make tea or coffee in the room. However you can easily stock up on snacks and drinks from several small supermarkets within a short walk. There’s one directly across the road from the hotel’s main entrance. And there was also a vending machine just outside our room,with water, soft drinks, snacks and even alcohol-free beers! I was quite impressed by the size of the ensuite, which had a large walk in rainfall shower and elegant decor. Basic toiletries are provided free of charge, and there was a small amenities kit as well. Towels were provided for use in the room, and pool towels could be hired. The hotel gave us vouchers to cover free hire of one towel per person, but there’s a 1 Euro charge if you want to swap it for a fresh towel. The public areas of the Sol Costa Atlantis and all rooms have free high-speed WiFi, which was fast and reliable. There’s also satellite TV in each room, with a wide selection of international channels. And the hotel offers laundry and ironing services for an additional charge, should you need them during your visit. Our room had a balcony with a small table and chairs but unfortunately the balcony looked directly out onto a number of other high-rise buildings. To the left was a view of the mountains of the Teide National Park and to the right, I could just about see a tantalising glimpse of the Atlantic ocean. Meanwhile, the ceiling-to-floor windows by the lift showed me the fabulous view of the sea that we would have enjoyed if we’d upgraded at check-in! You can pay a little more to have a Sol room with a view of the Teide mountains or of the sea. Alternatively you can upgrade to a premium Xtra room, with a hydrobath, minibar, and a terrace with a panoramic view. If you’re planning to stay at the Sol Costa Atlantis, I would definitely recommend upgrading when you book or when checking in. The Sol Costa Atlantis is well equipped to make your holiday in Puerto de la Cruz a comfortable one. The hotel’s elegant foyer has plenty of areas where you can sit and relax. These are ideal if you want to escape the heat of the afternoon sun. And I was delighted to see that the hotel provides fruit infused waters that you can help yourself to. This was very welcome when we came back to the hotel after an afternoon of sightseeing! A good pool is always a vital part of any sun holiday, but even more so when you visit Puerto de la Cruz. That’s because the beaches aren’t the long golden (man-made!) beaches that you’ll see in the south of the island. Instead you’ll see black volcanic sand on the beaches in Puerto de la Cruz. And the water is often too rough for you to be able to go in and cool off. Luckily the Sol Costa Atlantis has a lovely pool with plenty of sunloungers lined up for you to relax on. And you can also hire one of the three Bali beds to recline on in luxury. There’s a small children’s pool alongside the main pool, and a poolside bar offers refreshing snacks and cold drinks. While I was photographing our room, Mark went off to find the hotel’s bar. I found him relaxing with a glass of wine when I went downstairs, and joined him for an alcohol-free beer. The In and Out bar is a large, bright space with a good range of wines, beers and soft drinks, plus a small selection of cocktails on offer. The bar also opens out onto a sunny terrace, with sea views and plenty of comfy seating and sunshades. The In and Out bar is only open from 5pm onwards. But it does stay open fairly late, and they also have live music in the bar on selected nights. The 14th floor of the Sol Costa Atlantis is where you’ll find the hotel’s fully equipped Spa. It has a glass dome which offers spectacular views of the sea and El Teide. You can book in for a range of massages and beauty treatments. You’ll also find a hydrothermal circuit with facilities including microbubble beds, sauna, Turkish bath and an ice fountain. There are also hydromassage bathtubs and a special VIP area for couples. The spa is open to guests aged 16 or older, with an additional charge payable to use the facilities. Mark and I didn’t use the spa during our visit, as we just had so much else to see! The hotel also has a fitness centre which is available for guests to use at no extra charge. The hotel’s reception is open 24 hours a day. The staff are able to help with a wide range of queries including car hire, currency exchange and excusion booking. A medical centre is available within a few minute of the hotel. Our Jet2 Holiday at the Sol Costa Atlantis was on a bed and breakfast basis only. But the hotel has a restaurant, so you can also book on a half-board basis or add dinners while you are there. The breakfasts at the Sol Costa Atlantis are on a buffet basis, with a wide range of foods and drink to choose from. We took advantage of this to make sure that we started each day of our visit with a hearty breakfast! I loved the range of fruit and yoghurts which were on offer. Massive bowls of yoghurt were set out, both plain and in a variety of fruit flavours. To this you could add from a wide variety of fresh and dried fruits as well as nuts and seeds. And there were also pots of yoghurt available if you prefer that. The buffet also included a wide selection of cold sliced meats and cheeses, plus jams, marmalade, salmon paste and membrillo. And there were plenty of fresh baked breads to help yourself to. But if you prefer a hot breakfast, there was even more choice available on the hot plates! Every day there would be a wide selection of meat, eggs, vegetables and other items to choose from. You could mix and match to your heart’s content, and construct your perfect cooked breakfast. Pancakes and omelettes were freshly cooked to order, and there were even churros and hot chocolate. Or if you have a sweet tooth in the morning, then you could snack on a spread of croissants, muffins, doughnuts and other baked goods. The drinks on offer included a variety of fresh fruit juices, teas, coffees and herbal teas. There was even a large ice bucket full of bottles of sparkling wine that you could help yourself to. We really enjoyed the breakfasts at the Sol Costa Atlantis. The variety and quality of food was good, and it set us up well for the busy days we had planned. Although we were staying at the hotel on a bed and breakfast basis, we ate dinner at the restaurant on our first evening. The additional cost for dinner is 19.50 euro per person, which doesn’t include drinks. As with breakfast, the food is served buffet style and you help yourself. You can choose from a variety of soups or pasta and rice salads to start your meal. There is also a selection of cold meats and cheeses available. After that, you can pick from dishes such as spaghetti bolognaise or paella, with a number of side dishes available to choose from. There are also hot plates where chefs will cook steaks, sausages or fish to order. Mark went for the fish option, while I picked a small steak and a spicy sausage. The potatoes were covered in the island’s traditional red mojo sauce, but it was quite bland compared to some of the sauces I tried in other restaurants. And then you are really spoiled for choice at the end of your meal! The wide range of sweet treats included profiteroles, cheesecake, chocolate mousse and much more. Our complimentary stay at the Sol Costa Atlantis didn’t include dinner, and the bill for both of us came to around 50 Euro including drinks. While that isn’t a bad price to pay for three courses and drinks for two people, eating out is very inexpensive in Puerto de la Cruz. We paid less than 50 Euro most times that we ate out at restaurants in the city. And with so much delicious local food to try, I would only recommend eating dinner in the hotel if you arrive too tired and late to go out on your first evening. The Sol Costa Atlantis is perfectly placed for exploring the beautiful city of Puerto de la Cruz. You’ll love wandering through side streets full of traditional Canarian architecture, and seeing the fabulously coloured houses. The Lago Martianez is perfect for relaxing in the sun and bathing in pools of filtered sea water that fill and empty with the tides. And the Botanic Gardens and Sitio Litre Orchid Garden are a must see for gardening lovers. Or why not take an excusion to the Teide National Park, and take a cable car ride to the top of Mount Teide! Mark and I really enjoyed our stay at the Sol Costa Atlantis. It made an excellent base for our visit to Puerto de la Cruz, with a location that meant we could easily walk down the promenade into the city. The room was very clean and comfortable, and we both slept well during our visit. And the breakfast buffet had so many options that it was sometimes hard to decide what to eat each morning. The hotel’s foyer has a very elegant look, and I loved the sunny terrace outside the hotel. I’m sure that if we’d stayed longer in Tenerife, we’d both have made use of the pool and pool bar, not to mention the roof top spa! That’s not to say that the hotel was without faults. I did miss being able to make a cup of coffee first thing in the morning, and the daily charge for using the safe seemed odd. It’s also definitely worth upgrading to one of the more expensive rooms if you want a nice view from your balcony. 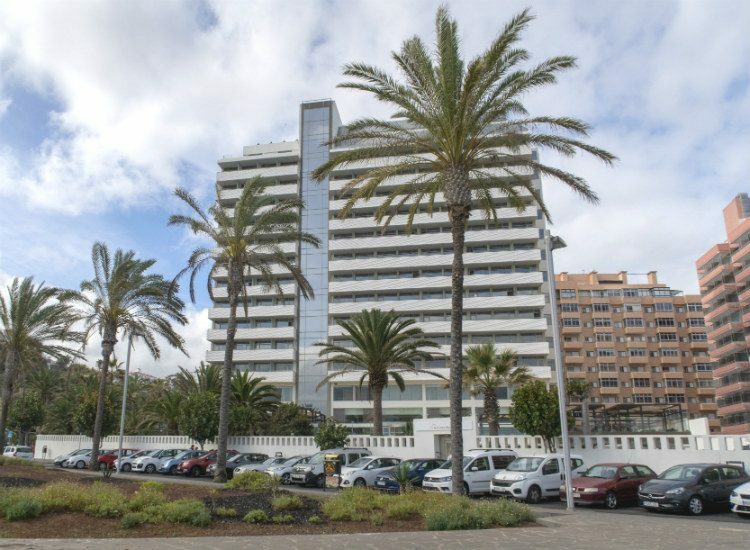 But if like me, you tend to view a holiday hotel as a place to sleep in between long periods of sightseeing, the Sol Costa Atlantis is an excellent choice for your visit to Puerto de la Cruz. We stayed at the Sol Costa Atlantis as guests of Jet2 Holidays. Our break was complimentary, but if we had booked through the website in January 2019, we would have paid £960 for a four night holiday. This price is for two people sharing a double room on a bed and breakfast basis. It also includes flights from Birmingham, and shared transfers. Breakfast is a big indicator of the quality of a hotel for me. Looks like this one ticked all the breakfast boxes – you’ve gotta have a churros option for breakfast in Spain! You could easily have something different for breakfast every day!